Preheat oven to 400 degrees F (200 degrees C). Prepare a 9x13 inch baking dish with 3 tablespoons butter. 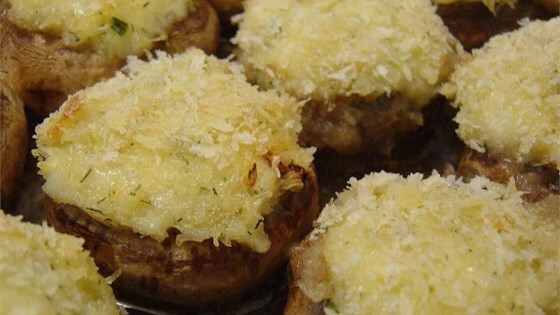 Remove stems from mushrooms. Set aside caps. Finely chop stems. Melt 2 tablespoons butter in a medium saucepan over medium heat. Stir in the chopped stems and green onions and cook until soft, about 3 minutes. Remove saucepan from heat. Stir in lemon juice, crabmeat, soft bread crumbs, egg, dill weed and 1/4 cup Monterey Jack cheese. Thoroughly blend the mixture. Place mushroom caps in the buttered pan, and stir until caps are coated with the butter. Arrange caps cavity side up, and stuff cavities generously with the green onion and crabmeat mixture. Top with remaining Monterey Jack cheese. Pour wine into the pan around the mushrooms. Bake uncovered in the preheated oven 15 to 20 minutes, until cheese is melted and lightly browned. Serve warm. How anyone could have given this recipe 5 stars is beyond me. While they were easy to make, they had no flavor whatsoever. These were so good! I used imitation crab meat and they were delicious!